Everyone has their own unique dream vacation location, but it's not surprising that many people rate the Caribbean islands and nations as being among the most desirable destinations in the world. These islands benefit from some of the warmest weathers and sunniest weather imaginable, ensuring that every starts brightly and ends with a stunning sunset. The beaches around the Caribbean are breathtaking in every possible way, allowing visitors and locals to engage in every kind of water sport and beach activity imaginable from surfing and sailing to simply relaxing on the beach with good food and good company. If you're planning a trip to the Caribbean, you have a lot of different locations to choose from, which is why so many people choose to book a spot on a Caribbean cruise and see multiple destinations in just one trip. 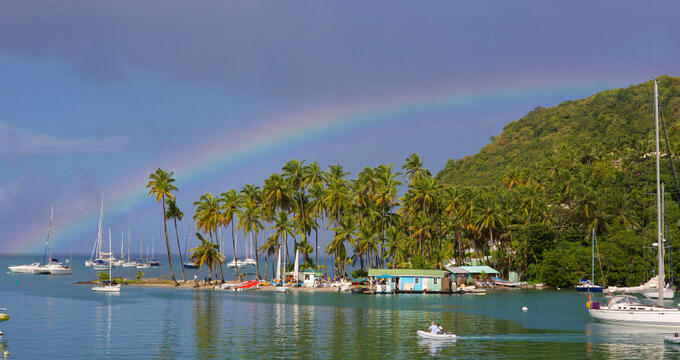 Of those destinations, Saint Lucia is easily one of the prettiest. This sovereign island country is located in the Lesser Antilles region and covers an area of around 238 square miles in total. Saint Lucia has a long coastline, with a lot of gorgeous beaches dotted around the north, south, east, and west of the island, so there's plenty of sun, sand, and sea for all to enjoy. If you’re visiting St Lucia, there’s a good chance you’ll want to spend a lot of time out on the beach, listening to the waves as you soak up some sun or actually wading out to sea to feel the warmth of the Caribbean waters on your body. In either case, you have a lot of excellent beaches to visit and it’s impossible to see them all in just one trip. To help you prioritize, we’ve compiled some useful overviews and details on the very best beaches of St Lucia. Rather than just one beach, Marigot Bay is made up of several little sandy spots all dotted about on the western side of the island, not far from Castries. This St Lucia beach is so pretty it's actually been used as a filming location for several Hollywood movies over the years. With very tall palm trees and lots of little boats sailing by, it's a lovely spot to simply sit and relax with friends, family, or a special someone. Due to Marigot Bay's beauty, it can get busy sometimes, so try heading here on a weekday if you're looking for a little more privacy. On the northwestern shore of St Lucia, Reduit is generally regarded as the best beach on the island due to its size, beauty, and amenities. Lots of upscale resort hotels are found near this beach, and various vendors and rental stores can be found to provide all you'll need for a fulfilling day of fun in the sun. All kinds of water sports and beach games can be enjoyed here, and visitors will have a big choice of bars and eateries when looking for a meal or juicy cocktail to cool down after basking in the sun for a few hours. Most of St Lucia's best beaches are found on the western shore of the island, but Grande Anse is one of the top destinations if you're feeling adventurous enough to head off to the rockier eastern coast. The shoreline is dominated by mountains and cliffs here, but Grande Anse beach is one of the few secluded sandy spots in this area. The western beaches are quite built-up with touristic amenities and resorts, but Grande Anse is almost entirely untouched. It's a very popular spot to do some wildlife watching, with lots of sea turtles seen nesting on the beach at various times of the year. Technically known as the Pigeon Island National Park, this beach is found at the northern part of St Lucia and is one of the top spots on the island for nature lovers or outdoor enthusiasts. There are lots of fun activities to be found around the National Park, including scenic hiking trails and climbing spots, as well as a museum and a couple of highly-rated restaurants. The beach itself offers typically soft sands and warm waters, just right for swimming and tanning. Many visitors to St Lucia will undoubtedly visit the island's capital city of Castries. If you're in the city, La Toc is the closest beach to you. It's just a short walk from downtown Castries, offering all the amenities of the city just a few minutes away from the sand. A comfortable and cozy beach with a secluded, private-island sort of atmosphere due to the tall trees and lush vegetation all around, La Toc offers some very pretty views and a surprisingly calm atmosphere. Named after the soft, sugary sands found all along its length, Sugar Beach is one of the most beautiful beaches on St Lucia. The first thing that stands out about this beach is its silky smooth sands, but if you take a look up, you'll be rewarded with astonishing views of the nearby Piton Mountains and lush wilderness all around. Located on the western shore of the island, Sugar Beach is conveniently situated quite close to the city of Soufriere. Prospective visitors to this beach need to be aware that part of it is private, reserved exclusively for guests of the Sugar Beach Resort, but the rest is fully open to the public and ideal for sunbathing and swimming.